This convenient smaller size ColorStaff(18 inches by 14 inches) fits on most music stands or can be held easily with one hand. Includes 96 felt circles which match the colors of KidsPlay brand handbells and deskbells. Each felt circle has a hook and loop style fastener so it can easily be placed on and removed from the fabric staff. 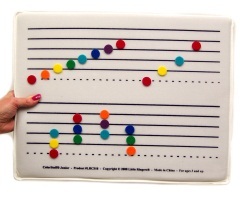 Great for learning both melodies and chords and for introducing the concept of the music staff.